Tulipa 'Parrot' (Tulipa 'Parrot'): growing, planting, caring. 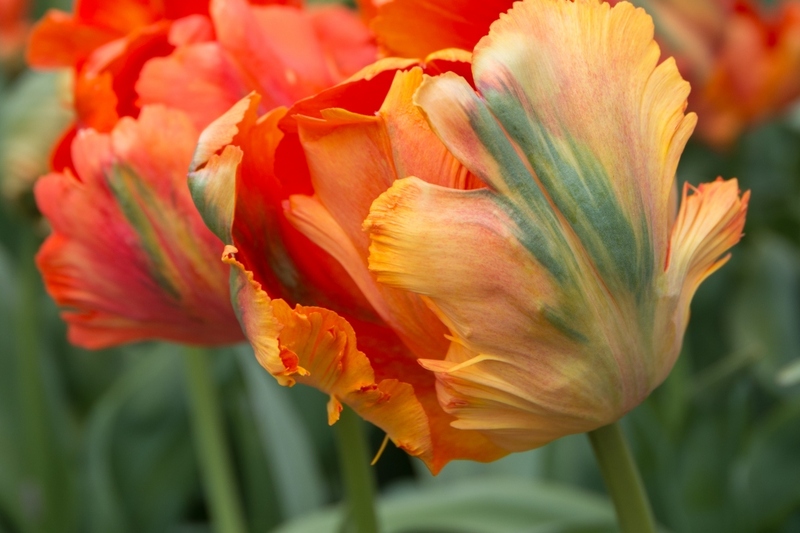 A group of cup-shaped, fringed, twisted and ruffled tulips with vivid, flame-like splashes, stripes or feathery markings. Full description for Tulipa 'Parrot' not yet available. There are many hybrid varieties of tulips — early, late, large, small, striped or viridiflora — and they're available in more colors than their so-called "botanical" cousins. However, they're more demanding and they tend to tire out more quickly! Tulip bulb planting begins at the start of Autumn and continues until December, at the latest. Choose batches of 10 - 50 bulbs rather than planting in 3's or 4's — try abundance! When planting outdoors, aerate the soil thoroughly to remove any weeds and pebbles, then add a bit of peat and sand. If possible, wait a few days before planting. The depth of the hole depends on the size of the bulb that you'd like to plant — approximately 10 cm for a medium-sized tulip bulb. In any case, the depth should equal two and a half times the eventual height of the tulips. Use a bulb dibbler to help planting; it's calibrated to make things easy! Sink it to the desired depth, then pull it out — it'll bring the soil back up with it! Place the bulb at the bottom of the hole, point facing upwards. You may place a small layer of sand at the bottom of the hole so that the bulb always has nice, dry roots. Cover with dirt — open the dibber, which will then release the earth it had pulled up. Finish with a good watering – that's it! If indoors, in a pot, or in a planter, plant the bulbs very close to each other in order to get a lovely, bunching effect. Don't cover them completely, let the tip of the bulb poke out of the soil. Water regularly. It may be necessary to thoroughly water the bulbs in spring, after vegetation regrowth — during flowering. Water potted bulbs regularly. Hybrid tulips prefer to stay dry during the summer, so tulip purists like to digs the bulbs out of the ground and store them somewhere sheltered after the leaves yellow, in order to transplant them in the autumn. If you took you bulbs into shelter in July, you must replant them in autumn!